The International Research Training Group (IRTG) “Baltic Borderlands: Shifting Boundaries of Mind and Culture in the Borderlands of the Baltic Sea Region”, a collaborative programme between the universities of Lund, Tartu, and Greifswald, will discuss the context and medialization of border crossing (or transgression) and the establishment (or dissolution) of borderlands. The panels encompass papers from the humanities and social sciences, e. g. history and art history, linguistics and literary studies, political sciences, gender studies, sociology, and digital humanities that address maps, literary texts, academic accounts, biographical notes, press media, film, digital productions and their story as well as the impact on conceptualizations of borders and borderlands. Pekka Hämäläinen and Samuel Truett reflect in their 2011 account “On Borderlands” about the expansion of research approaches and the usefulness of the fashionable (academic) application of the borderland concept in the humanities. Although the concept had been applied with varying degrees of success, the power of borderlands as analytical tool appears already in Gloria Anzaldúa’s summary of her own stories of living in the borderland, namely borderlands exist wherever two or more cultures exist. Similarly, the observation of Etienne Balibar that “borders are everywhere” rely very much on narrativizations of experiences through different channels. These channels are particularly interesting in the context of this conference and include poetry, maps, biographical accounts and, more recently, numerous digital approaches. Globalization supported a perspective of borderlessness beyond any containments like national, imperial or regional spaces and opened up these centrist research perspectives on spaces and orders. Spatial mobility here implies to cross borders, but does not mean to cross them out. They continue to be part of our cognitive and physical world. They remain part of our social, cultural, political and economic world making processes not only through experiences at and across the border but particularly through debates, discourses and images embedded in a multitude of narratives. We therefore ask: What happens with borders and borderlands in the narratives about times of historical and contemporary globalization? Do we cross or transgress borders? What does it mean when we use one or the other concept? Who has particular interest to present borders and borderlands in a specific way? Which media were used to disseminate ideas? Which of these choices confirm and which subvert the border? Do media and communication have an impact on these processes and hereby influence perceptions, constructions and dissolution of borders and borderlands? 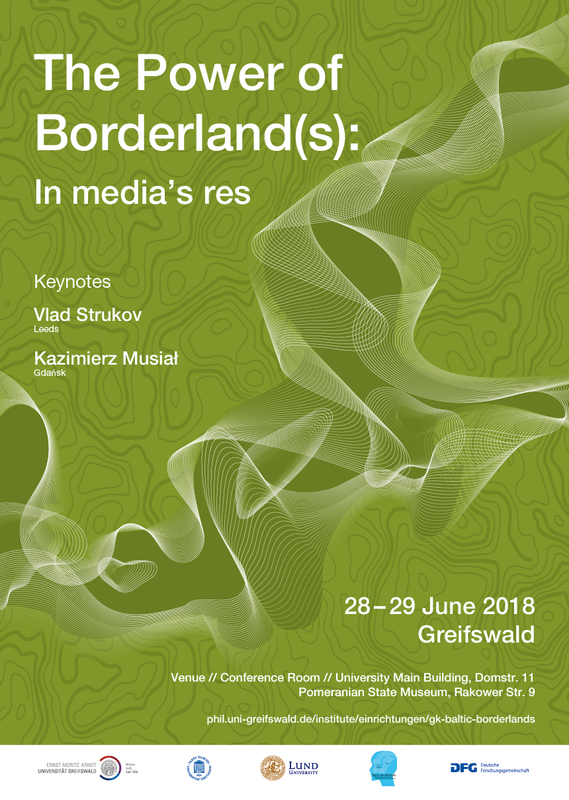 Our keynote speakers will be Vlad Strukov (Leeds) and Kazimierz Musiał (Gdańsk). Verglichen mit anderen Ländern, insbesondere den Vereinigten Staaten, Deutschland und Israel, ist Antisemitismusforschung in Skandinavien auf institutioneller und personaler Ebene relativ marginalisiert. Dies betrifft insbesondere Forschung jenseits der Phase des Faschismus, Zweiten Weltkriegs und Holocausts. Zudem bleibt die historische Entwicklung antijüdischer Stereotypen im Vergleich zu anderen Vorurteilen und Minderheitengruppen in Skandinavien relativ unzureichend erforscht, wie auch insgesamt die jüdische Geschichte an den Universitäten nur schwach vertreten ist. Diese Konferenz beschäftigt sich nicht primär mit dem Sammeln von Wissen über Antisemitismus in Skandinavien, dessen Ausbrüchen und Formen, historische Dimensionen oder wie dieser bekämpft werden kann. Vielmehr geht es darum zu erfahren, welche Forschungsstrategien und politischen Forderungen in Bezug auf Antisemitismusforschung bestehen oder in Zukunft notwendig sind. Es geht also um eine Bestandsaufnahme der Rahmenbedingungen und sowie die Zukunftsaussichten des Forschungsfelds in der näheren Zukunft, sowohl inhaltlich als auch bezüglich der institutionellen Unterstützung. Diese Fragen diskutieren renommierte ForscherInnen aus Norwegen, Dänemark, Schweden und Finnland. Dazu stellen NachwuchswissenschaftlerInnen ihre Forschungsprojekte zum Thema vor. Die Konferenz ist eine Kooperation des Lehrstuhls für Nordische Geschichte, des Historischen Instituts der Universität Göteborg und des Zentrums für jüdische Studien an der Universität Uppsala. Sie wird gefördert vom schwedischen Vetenskapsrådet. ZuhörerInnen sind herzlich willkommen, eine Anmeldung ist nicht erforderlich. Tagung/Symposium im Geheimen Staatsarchiv Berlin, 28.-30.09.2017.